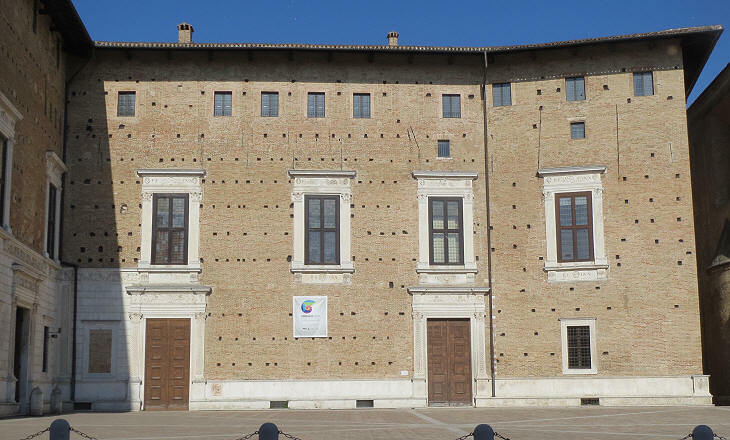 Urbino is situated on two hills between the valley of the River Foglia, which empties at Pesaro, to the north and that of the River Metauro, which empties between Fano and Senigallia, to the south. It is not considered part of Montefeltro, a mountainous region to its north, but it is very close to it. Sassocorvaro, which is located in that region, is only eight miles from Urbino. Urbino does not retain much evidence of Urbinum Metaurense, a town mentioned by Pliny the Elder and other Latin writers, apart from its steep streets. 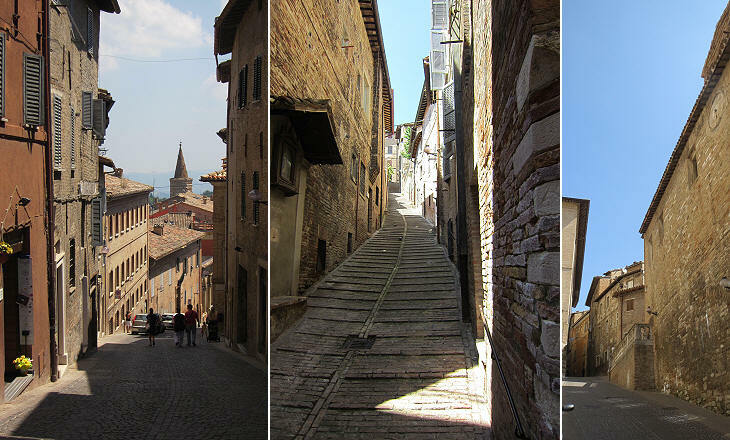 The Romans built straight streets regardless of the steepness of the site. In the XIIth century Urbino became a Comune, an independent city-state, which however both the Popes and the German Emperors regarded as their possession. Emperors Frederick I and Frederick II assigned the town to the Counts of Carpegna (the main mountain of Montefeltro) who because of their origin were called Montefeltrani and more commonly da Montefeltro. In 1359 they were ousted from Urbino by Cardinal Gil de Albornoz who restored papal authority over the region. However, in 1374 the da Montefeltro returned to the town. 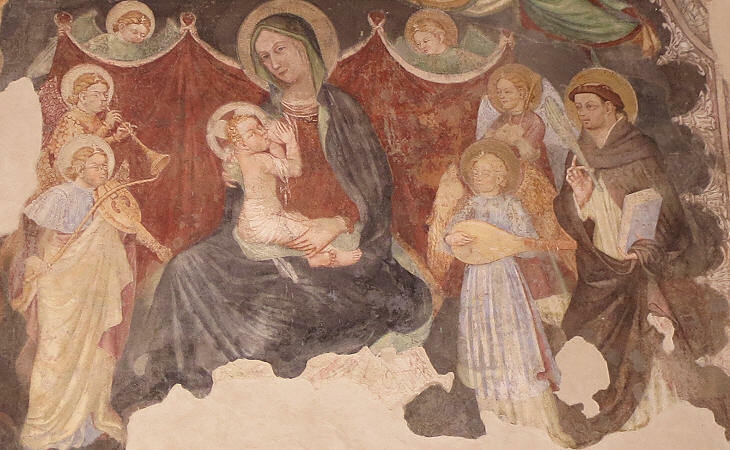 In 1417 the fortunes of this family were helped by the election of Pope Martin V, who had been Bishop of Urbino for more than twenty years and whose niece married Guidantonio da Montefeltro. The Pope conferred on Guidantonio a Golden Rose, an award reserved to sovereigns. In 1443 Pope Eugenius IV, his successor, gave the da Montefeltro the title of Dukes of Urbino. They were therefore Counts (for the German Emperors) and Dukes (for the Popes) of Urbino. 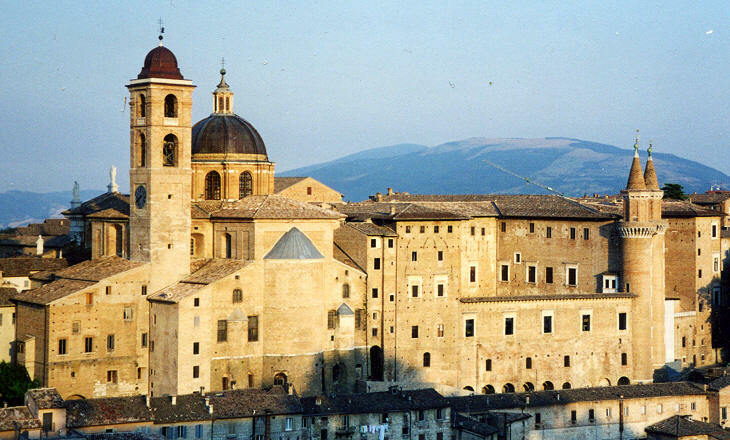 S. Francesco is the finest medieval church of Urbino. Its interior was entirely redesigned in the XVIIIth century, but the façade was not affected by the renovation. The church and the adjoining convent are situated at the very centre of the town between its two hills (il Poggio and il Monte) at the starting point of four streets which lead to the gates of the town. This position shows the importance achieved by the Franciscan Order. Many members of the wealthiest families of the town chose to be buried in this church; a Renaissance chapel is covered in page three. The first Cathedral was built in the XIth century and then it was redesigned in the XVth century. 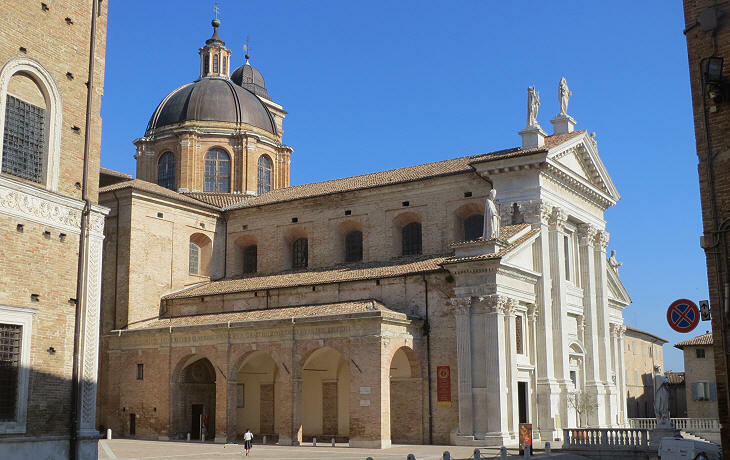 In 1781 the dome collapsed because of an earthquake and the church was entirely rebuilt in the following years in a style which does not match the overall Renaissance context of Urbino. In particular the 1802 white façade with its large statues (similar to many Roman ones) contrasts with the reddish colour which characterizes the town. The da Montefeltro lived in a fortified site (Castellare) next to the Cathedral on the highest point of il Poggio. In 1444 Duke Federico da Montefeltro who had just succeeded his brother, killed by members of the court because of his dissolute behaviour, decided he needed a better residence. Maso di Bartolomeo, a Florentine sculptor and architect, designed the central section of the current palace having a width of five windows. Federico da Montefeltro was a condottiere and he spent most of his time fighting in the battlefield. The Republic of Venice, that of Florence, the Duke of Milan, the Pope and the King of Naples all availed themselves of his services. In this "business" he had a major competitor in Sigismondo Pandolfo Malatesta who controlled Rimini and other coastal towns, including Fano. Although in some circumstances the two had to establish peaceful relations, they always tried to eliminate each other. 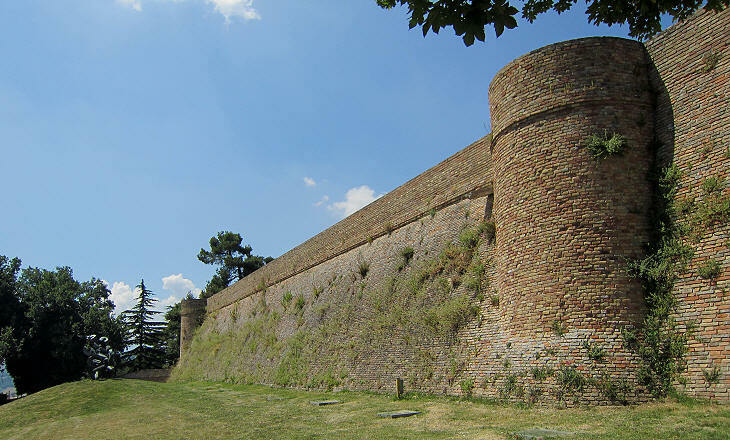 In 1462 Federico defeated Sigismondo near Senigallia and in the following year seized Fano. He was fighting on behalf of Pope Pius II who in return for his services assigned him some of Sigismondo's possessions. At this point Federico felt his palace at Urbino needed to be upgraded. Federico entrusted the redesign and enlargement of his palace to Luciano Laurana, who was born in Dalmatia (at the time a Venetian territory) and who had worked for the Gonzaga at Mantua. From the letter of appointment of Laurana we know that Federico first looked for an architect from Tuscany, but eventually chose Laurana and empowered him to manage all aspects of the construction. 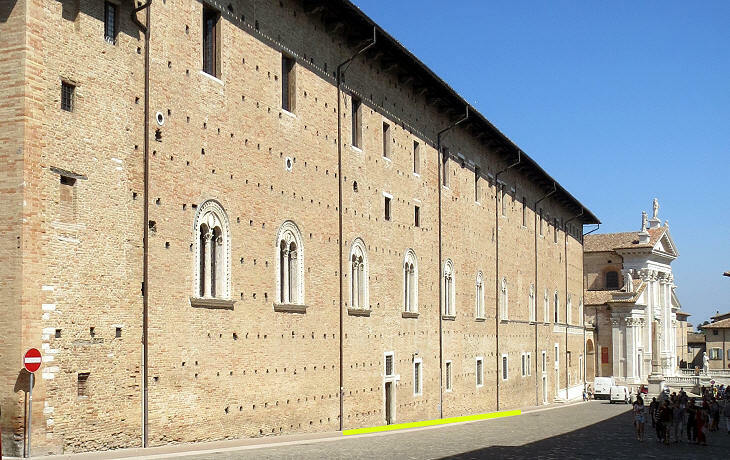 The building was enlarged on both sides with new wings; the right one in particular has a very innovative design and it was completed by Francesco di Giorgio Martini from Siena. He was an expert in gunpowder to whom Federico had commissioned the renovation of several fortresses (e.g. San Leo) and who was charged with the completion of Palazzo Ducale in 1472 after Laurana had left Urbino for Naples where he worked as a military architect. The elaborate decoration framing windows and portals was made by Ambrogio Barocci from Milan who headed a group of talented stonecutters. They executed designs developed by Laurana and Di Giorgio Martini. 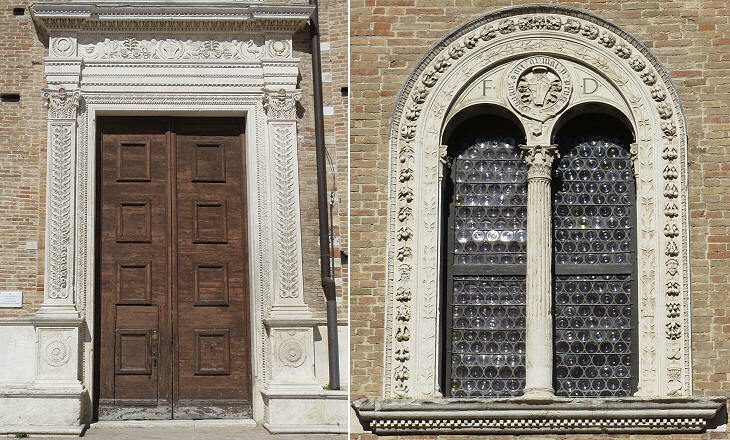 This elaborate decoration makes these windows and portals easily recognizable and is a feature of other palaces of the Dukes of Urbino at Gubbio and Pesaro. Palazzo Ducale is built on the edge of the hill and its rear side is supported by massive substructures. 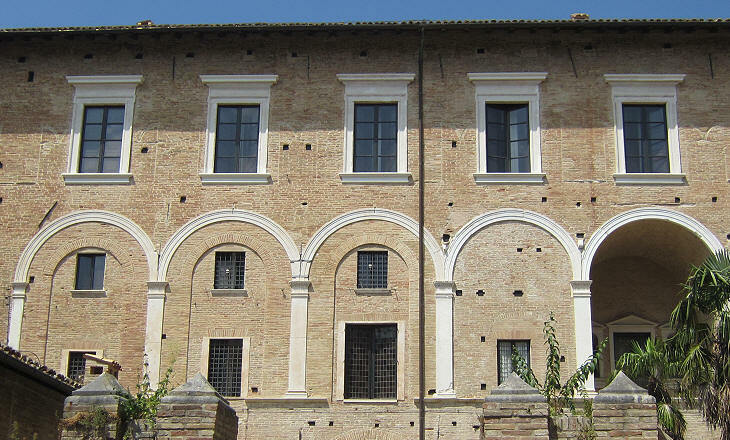 It is clearly visible from a great distance to travellers coming to Urbino from Rome and therefore Laurana built a rear façade which immediately showed the wealth and power of Federico to them. The two slender cylindrical towers have become the symbol of the town. 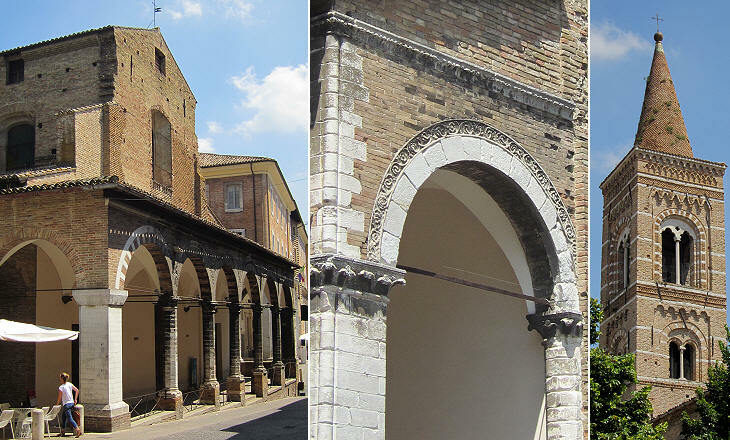 The three large loggias having the shape of a Roman triumphal arch (their vaults recall that of Arco di Settimio Severo in Rome) show the ingenuity of Laurana in breaking away from medieval patterns. Palazzo Ducale was not completed during the lifetime of Federico da Montefeltro (d. 1482), but in the XVIth century by the della Rovere, one of whom married a daughter of Federico. 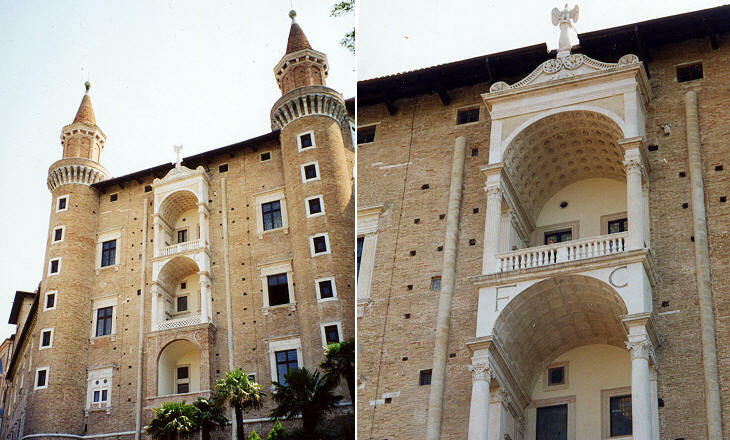 In 1631 the Duchy of Urbino was completely incorporated into the Papal State and Palazzo Ducale was in part modified, as it was no longer used as the residence of a sovereign. In page two you can see some images of its interior. S. Domenico was built in the XIVth century and it stands opposite Palazzo Ducale. The interior was renovated in the XVIIIth century, but the façade was not modified. 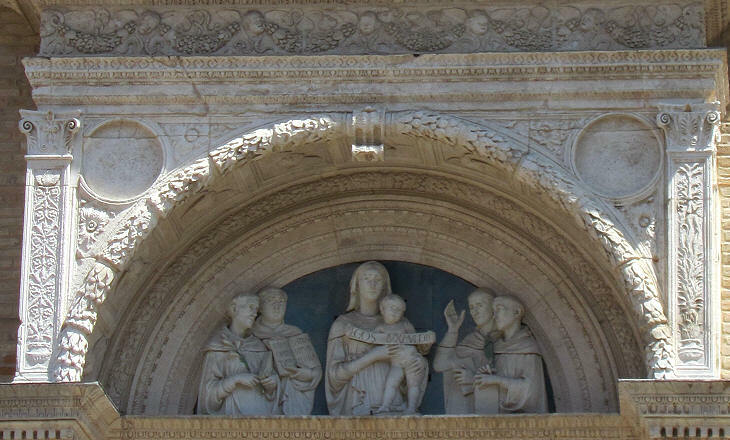 The portal was added by Federico da Montefeltro who commissioned it to Maso di Bartolomeo. Maso di Bartolomeo had worked in Tuscany with Donatello and Luca della Robbia prior to coming to Urbino and a glazed terracotta of the latter was placed in the portal (the original is inside Galleria Nazionale delle Marche at Palazzo Ducale). Considering that it was built in 1449-51 the portal is regarded as the first Renaissance monument of Urbino. 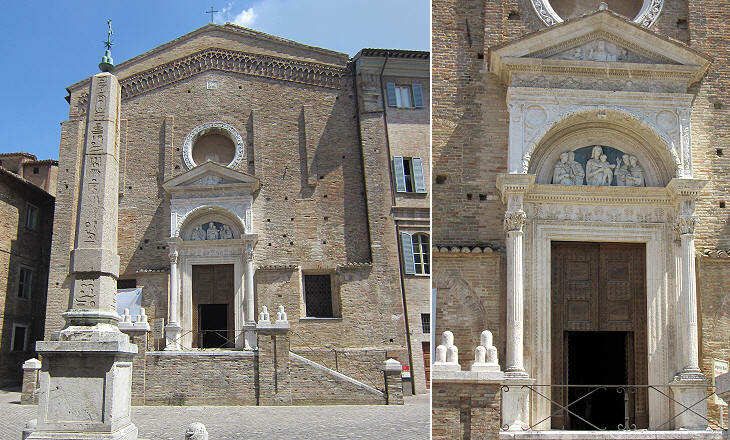 Move to page two: inside Palazzo Ducale or page three: the della Rovere or page four: XVIIIth century monuments.